A PRIVATE company has taken over much of London’s most famous street market by “fraud.” according to one of the company’s own directors. 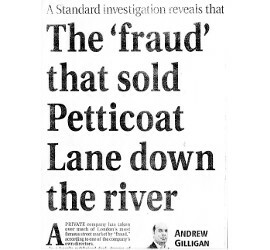 In a barely publicised deal, dozens of lucrative shops along the streets which make up Petticoat Lane – together with more than 400 flats on prime land inches from the City – have been given by their previous owners, Tower Hamlets council, to a company called Eastend Homes. The shops alone are estimated to have an open-market rental value of more than £1 million a year. However, Eastend Homes obtained the entire portfolio for nothing – and the council is even paying the firm to rent some of the properties back. The director concerned, Brad Prasad, resigned earlier this month, saying he is “upset and angry” at the alleged fraud. He has now gone into a safe house after receiving an anonymous death threat and police have been called in. Petticoat Lane itself is not, of course, a name you will find on any map. But many of the properties lining streets where the market is held – Wentworth Street, Goulston Street, Bell Lane,Toynbee Street and New Goulston Street – are, or rather were, owned by Tower Hamlets council. At ground level, the buildings along these streets arc shops and stall storage areas, vital parts of the market. But on the upper floors they are, or rather were, council flats, collectively known as the Holland Estate. The estate, almost wholly Bengali, is run down. Mould decorates some of the walls. In places, especially at night, the small 1930s courts and alleyways behind the market feel like Dickens’s slum rookeries. The Government doesn’t want local councils to own housing any more. It won’t allow blocks like these to be Improved unless they are transferred to private companies – like Eastend Homes. But the tenants have to agree, in a ballot. Many such ballots have gone against transfer – with residents preferring to stick with the council. On the Holland Estate it seemed, the story was different. Last year, the tenants voted decisively, by 74 per cent to 26 per cent, to hand over their estate complete with the lucrative shops along Petticoat Lane. But that, according to Mr Prasad, was where the fraud came in. “It came to my attention that three employees of Eastend Homes were going round from door to door collecting the balot papers which had been issued to residents.” says Mr Prasad. Each paper contained a unique numerical code, which you could use to cast your vote by phone. You called a certain number, typed in your code, and chose whether to vote Yes or No. But, says Mr Prasad, the ballot papers were taken away from many of the Holland Estate residents before they had had a chance to vote. Their votes, he claims, were cast for them – by telephone – by these three employees of Eastend Homes, whose names are known to the Standard. More than 80 people on the Holland Estate, says Mr Prasad, have now signed witness statements that their ballot papers were taken away from them before they could use them to vote. The Standard has spoken directly to about a dozen residents of the Holland Estate. All corroborate Mr Prasad’s claims. “They came and said could they have my ballot,” said Bashir Miah, of Brune House. “They said I didn’t know how to dial, they would do it for me.” People trusted the Eastend Homes staff because they had been around a lot on the estate, campaigning for the transfer, Mr Miah said. So they handed over their ballot papers. The total number of tenants voting in the ballot was 173 – on an estate where there are only 183 tenanted properties. Even allowing for the fact that some properties might be held on joint tenancies, with two votes per property, this seems an incredibly high turnout. Perhaps the tenants were simply attracted by the offer Eastend Homes made, it promised to spend £15 million over the next five years doing up the The Holland Estate including new kitchens and bathrooms for every tenant, new lifts and new community halls. It is also however, removing green spaces and trees in the area and proposing to build iew homes for sale on the land. Nor do tenants’ rights seem entirely assured: council documents seen by the Standard say only that tenants will “as far as possible” enjoy the same rights with Eastend Homes as they used to have with the council. Since Eastend Homes took over, residents say. they have suffered massive increases in their service charges. Abdul Karim, of Herbert House, says his charge has gone up rom £540 a year to £300 a quarter. Mr Nur ays his charge has quadrupled — from £600 ) £2.500. Police have told Mr Prasad that the call was made from an unregistered pay-as-you-go mobile phone. Meanwhile, Mr Prasad says, one of the Eastend employees who took the blank ballot papers from residents has been going round the estate, urging them not to sign the witness statements which testify to what happened. Eastend Homes is a comparatively new organisation, set up as a non-profit body to take over council homes from Tower Hamlets. It is registered as both a company and a cliarity and has local residents, such as Mr Prasad, on its board. Recently however, it has registered a now, commercial arm, East End Homes (Community Development) Ltd, and like many not-for-profit “social landlords” is keen to move into the profit-making sector. In an email to Mr Prasad, Eastend Homes’ chairman, Martin Young, said he was “shocked and dismayed” by the allegations of fraud, and had “immediately asked for a report” from Eastend Homes’s chief executive, Paul Bloss. “Any irregularity with the ballot will be addressed by the proper authorities,” he promised. Paul Bloss, the chief executive of Eastend Homes, refused to deny the central allegations of ballot fraud, saying: “I wouldn’t comment at all. It’s highly dangerous to jump to conclusions when allegations like this are made.” He said that any activity with private developers was to finance improvements to social housing, and stressed Eastend Homes was non-profit-making. A spokesman for Tower Hamlets said that there were no plans to conduct any kind of review of the ballot and claimed that there was “no evidence whatsoever” of any irregularities. However, official council documents seen by the Standard show that the council was aware of “serious allegations in relation to the conduct of voting” as early as August last year. At Petticoat Lane yesterday, it looked like business as usual. Stallholders were offering improbable deals. Tourists were trying on leather jackets. The stalls themselves remain under the council’s jurisdiction. But as far as the market as a whole is concerned, it may be the calm before the storm. « Holland Demolition - Residents survey out now!